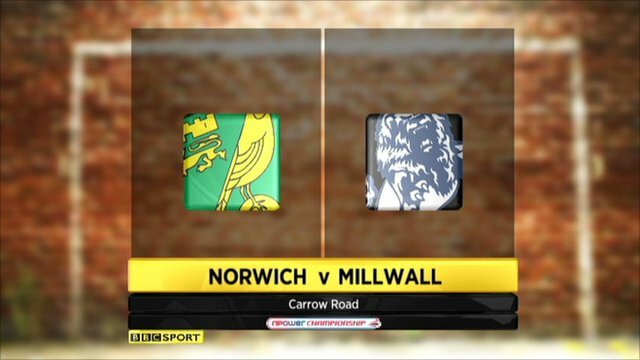 An injury-time goal from on-loan midfielder Henri Lansbury saw Norwich take all three points against Millwall at Carrow Road. Theo Robinson put the visitors ahead in the second half with a goal into the bottom right corner from close range. Elliot Ward levelled with a goal from inside the area after a Lansbury free-kick came back off the post. And Arsenal loanee Lansbury popped up with a late winner when he slotted Grant Holt's pass into the net. Norwich started off the brighter as Russell Martin linked up well with Andrew Crofts but when the Welshman found Simon Lappin in the box, he was unable to keep his volley down. Steve Morison had a chance for the visitors but his volley from distance just flew over John Ruddy's crossbar. Striker Simeon Jackson then skipped past the Millwall defence before shooting low at David Forde, but the goalkeeper was equal to the striker's effort. Millwall had to make a substitution after 15 minutes with top scorer Morison limping off and his replacement Robinson almost made an instant impact, but Ruddy did well to tip his volley over the crossbar. The Lions had a great chance to open the scoring on the half-hour when James Henry's corner found Darren Purse at the back post but the experienced defender fired over. The second half started controversially as Jackson went down in the area looking for a penalty but instead of pointing to the spot, the referee booked the player for simulation. Millwall responded and took the lead on 57 minutes as former Norwich loanee Henry broke quickly before delivering a ball towards Robinson, who placed the ball past Ruddy from six yards. Norwich went in search of an equaliser and Holt had a chance but could not direct his volley on goal from a Lansbury cross. Millwall could have snatched a second but Henry's shot was blocked by Marc Tierney. Instead, the home side finally levelled on 77 minutes when Lansbury's 25-yard free-kick came back off the post and Ward was on hand at the far post to smash the ball home. And with the last kick of the game, the ball fell into the path of Lansbury who prodded home to give the Canaries a vital three points. 90:00+5:10 The referee brings the game to a close. 90:00+4:27 Booking Henri Lansbury receives a yellow card for dissent. 90:00+3:28 Assist on the goal came from Grant Holt. 90:00+3:28 GOAL - Henri Lansbury:Norwich 2 - 1 Millwall Goal scored by Henri Lansbury from inside the penalty box to the bottom right corner of the goal. Norwich 2-1 Millwall. 90:00+3:05 Foul by Theo Robinson on Marc Tierney, free kick awarded. John Ruddy takes the free kick. 90:00+2:46 Theo Robinson crosses the ball, clearance by Leon Barnett. 90:00+1:01 Substitution Danny Schofield joins the action as a substitute, replacing James Henry. 89:52 Free kick awarded for a foul by Wesley Hoolahan on Alan Dunne. Free kick taken by David Forde. 89:37 A cross is delivered by Anthony McNamee, clearance made by Nadjim Abdou. 89:18 Andrew Crofts crosses the ball, Tamika Mkandawire makes a clearance. 88:00 Henri Lansbury challenges Nadjim Abdou unfairly and gives away a free kick. Free kick crossed right-footed by James Henry from right channel, save by John Ruddy. 87:37 Elliott Ward fouled by Theo Robinson, the ref awards a free kick. Direct free kick taken by John Ruddy. 85:10 Darren Purse gives away a free kick for an unfair challenge on Grant Holt. Henri Lansbury delivers the ball from the free kick left-footed from left channel, clearance by Liam Trotter. Inswinging corner taken by Anthony McNamee from the right by-line played to the near post, clearance by Darren Purse. 83:31 Marc Tierney delivers the ball. 82:27 Wesley Hoolahan fouled by Theo Robinson, the ref awards a free kick. Wesley Hoolahan restarts play with the free kick. 81:14 Henri Lansbury sends in a cross, David Forde makes a comfortable save. 80:37 Tamika Mkandawire concedes a free kick for a foul on Grant Holt. Henri Lansbury crosses the ball in from the free kick, Craig Eastmond makes a clearance. 76:19 Jack Smith concedes a free kick for a foul on Grant Holt. Henri Lansbury has a direct shot on goal from the free kick. Assist by Henri Lansbury. 76:19 GOAL - Elliott Ward:Norwich 1 - 1 Millwall Elliott Ward scores a goal from inside the six-yard box to the bottom left corner of the goal. Norwich 1-1 Millwall. 75:23 Booking Jack Smith receives a yellow card. 73:38 Liam Trotter challenges Henri Lansbury unfairly and gives away a free kick. Free kick crossed left-footed by Wesley Hoolahan, David Forde makes a save. The official flags Grant Holt offside. David Forde restarts play with the free kick. 72:21 Free kick awarded for a foul by Grant Holt on Darren Purse. Darren Purse restarts play with the free kick. 70:51 Theo Robinson delivers the ball. 69:05 A cross is delivered by Anthony McNamee, Henri Lansbury gives away a free kick for an unfair challenge on Nadjim Abdou. David Forde restarts play with the free kick. 67:51 Craig Eastmond takes a shot. Andrew Crofts gets a block in. 66:23 Shot from outside the penalty box by Wesley Hoolahan goes wide right of the goal. 65:14 Scott Barron crosses the ball, Shot by James Henry. Elliott Ward makes a clearance. Corner taken by Scott Barron, Darren Purse challenges Aaron Wilbraham unfairly and gives away a free kick. John Ruddy restarts play with the free kick. 63:11 Henri Lansbury sends in a cross, Effort on goal by Grant Holt from inside the area goes harmlessly over the bar. 63:02 The ball is delivered by Andrew Crofts, Tamika Mkandawire manages to make a clearance. 62:15 Marc Tierney gives away a free kick for an unfair challenge on Liam Trotter. Alan Dunne crosses the ball in from the free kick, clearance by Henri Lansbury. 60:30 Free kick awarded for a foul by Grant Holt on Nadjim Abdou. David Forde restarts play with the free kick. 59:49 Unfair challenge on Henri Lansbury by Theo Robinson results in a free kick. Free kick taken by Elliott Ward. 59:27 Shot by Grant Holt. Darren Purse gets a block in. 59:06 James Henry sends in a cross, clearance made by Andrew Crofts. 57:41 Substitution David Fox leaves the field to be replaced by Wesley Hoolahan. 57:41 Substitution Simeon Jackson goes off and Aaron Wilbraham comes on. 57:41 Substitution Anthony McNamee joins the action as a substitute, replacing Simon Lappin. 56:59 A cross is delivered by Simeon Jackson. 55:32 The assist for the goal came from James Henry. 55:32 GOAL - Theo Robinson:Norwich 0 - 1 Millwall Theo Robinson finds the net with a goal from close range to the bottom right corner of the goal. Norwich 0-1 Millwall. 54:18 The offside flag is raised against Theo Robinson. Elliott Ward restarts play with the free kick. 53:53 Alan Dunne sends in a cross, Leon Barnett manages to make a clearance. 53:27 James Henry produces a volleyed right-footed shot from 12 yards. Marc Tierney gets a block in. 52:59 Marc Tierney produces a cross, David Forde makes a save. 48:41 Booking Simeon Jackson booked for dissent. 47:35 The ball is swung over by Marc Tierney, clearance made by Jack Smith. 46:54 Free kick awarded for a foul by Tamika Mkandawire on Simeon Jackson. The free kick is delivered right-footed by David Fox from right channel, Darren Purse makes a clearance. 45:48 The ball is crossed by Simeon Jackson. 45:17 Handball decision goes against James Henry. Elliott Ward takes the indirect free kick. 45:00+2:03 The first half comes to an end. 45:00+0:23 Andrew Crofts crosses the ball, David Forde makes a save. 45:00 The ball is delivered by Scott Barron, clearance made by Andrew Crofts. 42:58 Elliott Ward challenges Liam Trotter unfairly and gives away a free kick. Direct effort from the free kick comes in from James Henry. 41:49 Free kick awarded for an unfair challenge on Simon Lappin by Nadjim Abdou. The free kick is swung in left-footed by Marc Tierney, David Forde makes a save. 40:42 Free kick awarded for a foul by Liam Trotter on Simeon Jackson. Elliott Ward restarts play with the free kick. 39:44 The ball is delivered by Alan Dunne, clearance by Elliott Ward. 38:29 Grant Holt has an effort at goal from the edge of the box that misses to the right of the target. 37:39 James Henry is penalised for a handball. John Ruddy takes the free kick. 36:37 Free kick awarded for a foul by Simeon Jackson on Darren Purse. David Forde restarts play with the free kick. 36:11 Jack Smith challenges Henri Lansbury unfairly and gives away a free kick. Direct free kick taken by Russell Martin. 34:58 Nadjim Abdou fouled by Andrew Crofts, the ref awards a free kick. Free kick crossed right-footed by Alan Dunne from left channel, Grant Holt makes a clearance. 34:58 Booking Andrew Crofts goes into the book for unsporting behaviour. 33:35 Alan Dunne challenges Grant Holt unfairly and gives away a free kick. John Ruddy takes the direct free kick. 33:24 James Henry sends in a cross, clearance made by Leon Barnett. 32:28 Simon Lappin gives away a free kick for an unfair challenge on James Henry. The free kick is swung in left-footed by James Henry, clearance by Leon Barnett. 31:55 The referee blows for offside against Simeon Jackson. Free kick taken by David Forde. 30:41 Inswinging corner taken by James Henry from the right by-line, Darren Purse has an effort at goal from close range which goes wide of the left-hand upright. 29:42 Centre by Henri Lansbury, clearance by Tamika Mkandawire. 26:58 Corner from the right by-line taken by David Fox, Header on goal by Leon Barnett from inside the box goes harmlessly over the target. 26:49 The ball is swung over by Henri Lansbury, Scott Barron manages to make a clearance. 26:34 Centre by Simon Lappin, clearance by Jack Smith. 26:17 The ball is sent over by Andrew Crofts, Darren Purse manages to make a clearance. 24:56 Henri Lansbury delivers the ball. 23:46 Corner taken by James Henry played to the near post, Simon Lappin makes a clearance. 22:58 Shot by Theo Robinson from 25 yards. Save by John Ruddy. Inswinging corner taken from the right by-line by Scott Barron, clearance by Russell Martin. 22:09 Centre by Simeon Jackson, clearance made by Jack Smith. 21:20 Marc Tierney concedes a free kick for a foul on Craig Eastmond. Free kick taken by David Forde. 20:02 The ball is sent over by Scott Barron. 19:02 Centre by James Henry. 18:14 Grant Holt delivers the ball, save made by David Forde. 16:09 Shot from long range by James Henry misses to the right of the goal. 15:51 Substitution Theo Robinson replaces Steve Morison. 13:34 Unfair challenge on Steve Morison by Leon Barnett results in a free kick. Tamika Mkandawire takes the direct free kick. 13:14 Effort on goal by Simeon Jackson from 12 yards. Save by David Forde. 12:49 Scott Barron has a drilled shot. Save by John Ruddy. 12:28 James Henry sends in a cross, save by John Ruddy. 11:23 The ball is sent over by Andrew Crofts, Effort on goal by Simon Lappin from inside the penalty area goes harmlessly over the bar. 9:13 Shot from just outside the box by Steve Morison goes over the bar. 8:12 The ball is sent over by Andrew Crofts, Effort on goal by Simon Lappin from just inside the penalty area goes harmlessly over the target. 7:23 Grant Holt is flagged offside by the assistant referee. David Forde takes the indirect free kick. 6:10 Corner from right by-line taken by David Fox. Foul by Liam Trotter on Elliott Ward, free kick awarded. Elliott Ward restarts play with the free kick. 5:57 Simeon Jackson sends in a cross, clearance made by James Henry. 2:35 The ball is crossed by Scott Barron, Russell Martin makes a clearance. Craig Eastmond takes the inswinging corner, save made by John Ruddy. 1:36 Simeon Jackson crosses the ball, Liam Trotter makes a clearance. 1:00 The ball is swung over by Craig Eastmond, Russell Martin manages to make a clearance.